A Corpus of Arabic Legal Documents (CALD) is a database of edited (transcribed) primary source materials from the pre-modern period (8th-15th century). According to the creators, CALD “is the first-ever collection of scattered editions of legal documents often [provided] with improved readings compared to earlier print versions”. CALD is supported by the European Research Council (ERC), and results from the concerted efforts of individuals from several institutions among which the Institut de recherche et d’histoire des textes (IRHT). 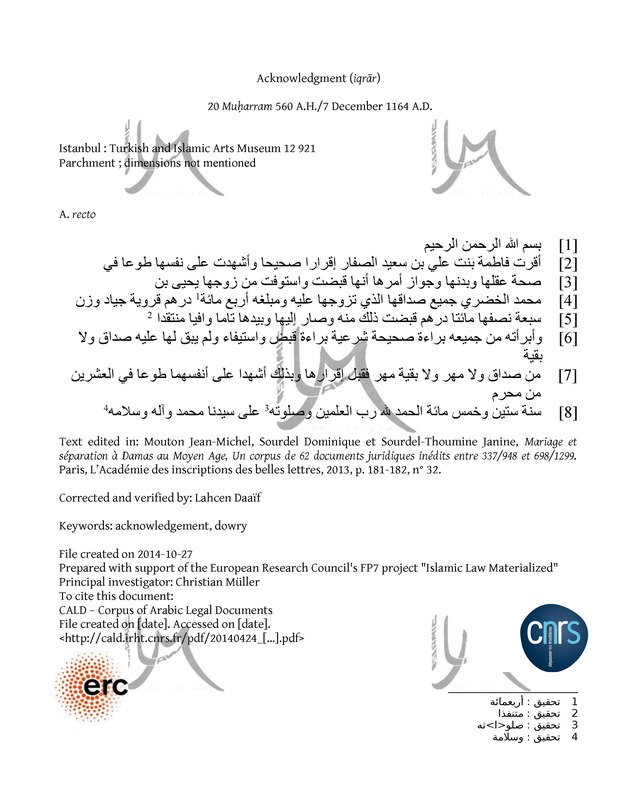 CALD includes a great variety of documents, such as sales contracts, lease contracts, acknowledgements, charity aims, court attestations, etc., available in PDF with the original Arabic text in modern spelling as well as complete bibliographical data. In addition, images of original materials and/or URL links are provided when possible. Visitors can browse documents either by location (city) or library inventory number, or search the database for legal terms in Arabic.For greater access to CALD’s functionalities, visitors can create an account: logging in allows to cross-search Arabic terms, document types, dates and keywords. The interface is available in French, English and Arabic. 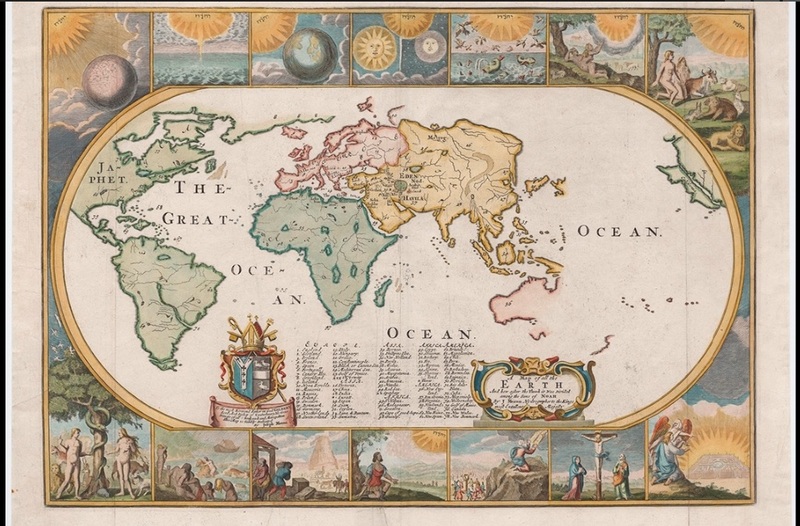 Persuasive Maps is a collection of more than 800 maps collected by P.J. Mode housed at Cornell University library. 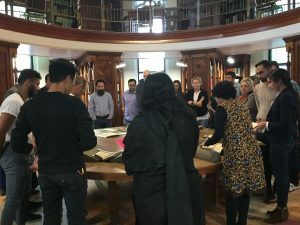 This collection holds maps dating from the 1800s to the present day and covers various geographical areas of the world. ….While this map provides a reasonably accurate view of the world as known in 1681, it was intended primarily for religious education, bound (folded) into copies of English-language bibles and other religious works of the 17th and early 18th centuries (Shirley 1983, #457). The seven days of creation are illustrated in the panels at the top of the map. Below are the expulsion from Paradise, the Flood, the Tower of Babel, God speaking to Moses, the Ten Commandments, the Crucifixion and the Ascension. The voice of God is represented by Hebrew characters…The map is centered on Eden. Persuasive Cartography seeks to communicate more than geographical information and intends to influence opinion or to send a particular message. Since maps represent a subject viewpoint, cartographers needed to decide what information to include or exclude. Maps sit somewhere on the spectrum between science and art and subjectivity and objectivity. The maps of this collated collection are chosen because they communicate messages beyond geographical information. For instance, they illustrate a whole range of human concerns from religious, political, military, commercial, moral and social. 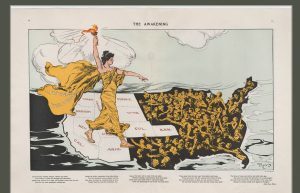 …Lady Liberty, wearing a cape labeled “Votes for Women,” stands astride the states (colored white) that had adopted suffrage. She holds aloft her torch, bringing “enlightenment” to women in those states still in the dark. The faces of these women are turned up to the light, and some reach out in hope. (Many have fashionably short hair and hats, reflecting the middle and upper class core of the suffrage movement. Dando 2010, 224)…. The collection can be searched or browsed by subject, posted date or the entire collection. Each item provides more information about the item such as title, subject, date, creator, size/extent, and collector’s note. The collector’s note are the result of P.J. Mode research and analysis. 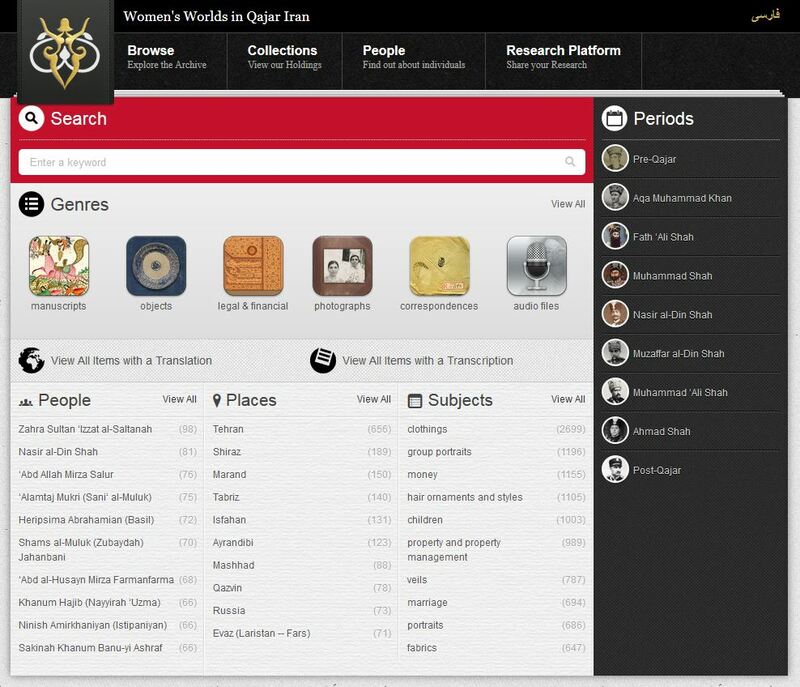 Women’s Worlds in Qajar Iran (WWQI) is a digital archive of materials related to the lives of women during the Qajar era, inclusive of the period immediately preceding and following the dynastic period (1786 -1925). 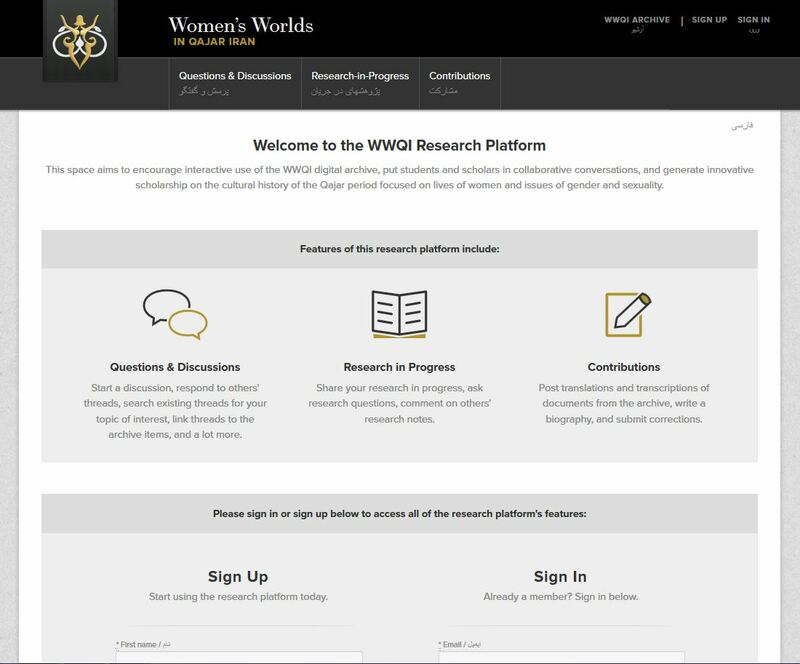 The goal of WWQI is to address a gap in scholarship and understanding of the lives of women during the Qajar era. WWQI aims to open up the documented social and cultural histories of Qajar women, thus allowing for the examinations of broader patterns of life during this era. You could begin your search either by clicking on “Collections” or on “Browse”. All roads tend to lead to the search engine, where you can refine your search with keywords and filter selection. 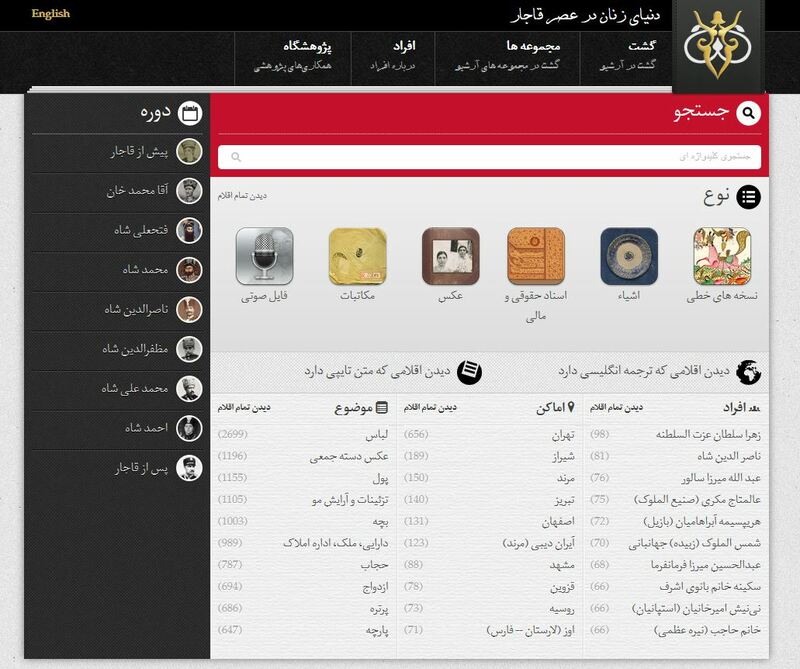 The website uses Elastic Search full text search engine which supports both English and Persian language-specific searches. While the results should be consistent, the results may vary slightly in terms of relevancy ranking. 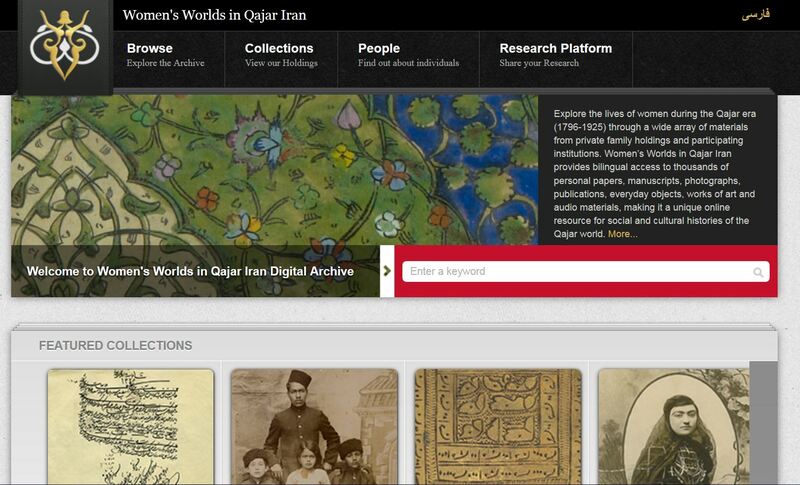 The website also includes a research platform which put students and scholars in collaborative conversations, and generate innovative scholarship on the cultural history of the Qajar period focused on lives of women and issues of gender and sexuality. To learn more about how the Archive generates the digital holdings, see the documentary essay by Nicole Legnani, Commissioned by the Office of the Digital Arts and Humanities at Harvard University. 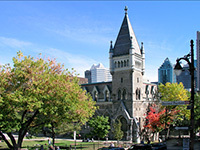 The Harvard University Library (HUL) central infrastructure accommodates all image, text, and audio materials collected for this archive. All WWQI materials can be accessed through the following Harvard University Library catalogues as well: Visual Information Access (VIA) system and HOLLIS Catalog. 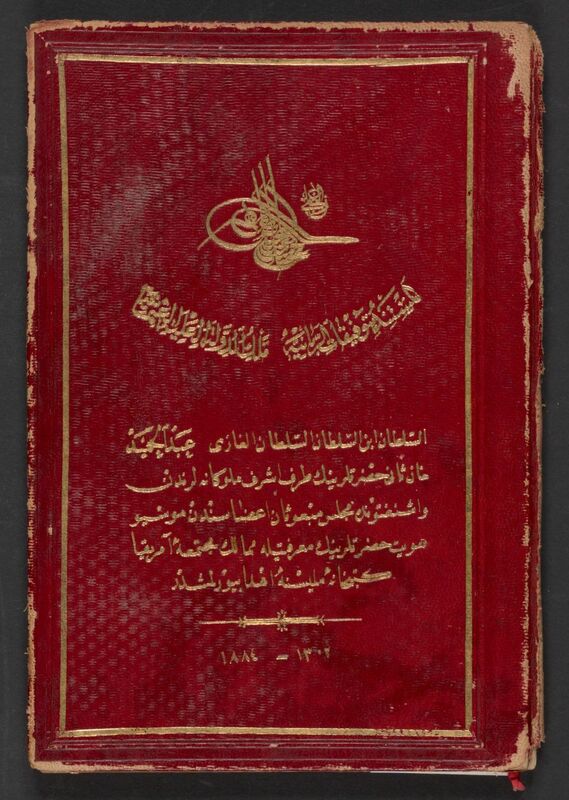 Among the Library of Congress‘ numerous digital collections, two collections include Ottoman photographic and textual materials from the African and Middle East Division: the Abdul Hamid II collection and the Abdul Hamid Collection of books and serials gifted to the Library of Congress. Made up of 1,819 photographs in 51 large-format albums from the late 19th century, the Abdul Hamid II collection illustrates the Ottoman Empire during the reign of Sultan Abdul-Hamid II, and the modernization of of the Ottoman Empire. Photographs were taken by well-known Ottoman commercial photographers, Turkish military photographers and the Photographic Unit of the Imperial School of Engineering. Abdul-Hamid (1842-1918) was an avid collector and promoter of photography. He presented a copy of the survey to the Library of Congress in 1893 or 1894 and gave a very similar collection to the British Museum (now housed in the British Library). 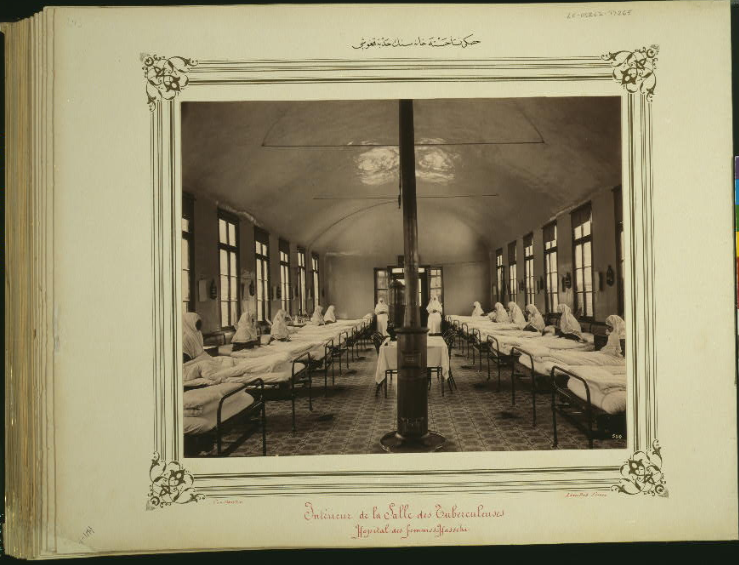 [Tuberculosis ward of the Hasköy Hospital for Women] / Abdullah Frères (Constantinople), between 1880 and 1883. “Gift made by H.I. M. the Sultan Abdul-Hamid II to the national library of the United States of America through the Honorable A.S. Hewitt Member of the House of Representatives A.H. 1302-1884 A.D.“. The collection was donatedto the Library of Congress in 1884. Digital contents are available for download in very high resolution, and free to use or reuse as they are in the public domain. “The book: Print and Manuscript…” is a free online course offered by Harvardx on edx (which is an online learning platform founded by Harvard and MIT University). This module is about the history of the book and printing. Books have played an important role in human history and life. At one time, books were the unique means of transmitting information and knowledge and thus shaped humanity’s understanding of the world. Books have existed in various forms and over the course of time have undergone significant changes. Developments in materials, printing techniques and methods have all affected the structure, format and availability of books. Moreover, illustrated books, handwritten and marginal annotations in books are discussed along with examples of manuscripts that are available online in the Harvard Libraries, which are accessible for deeper investigation and studies. 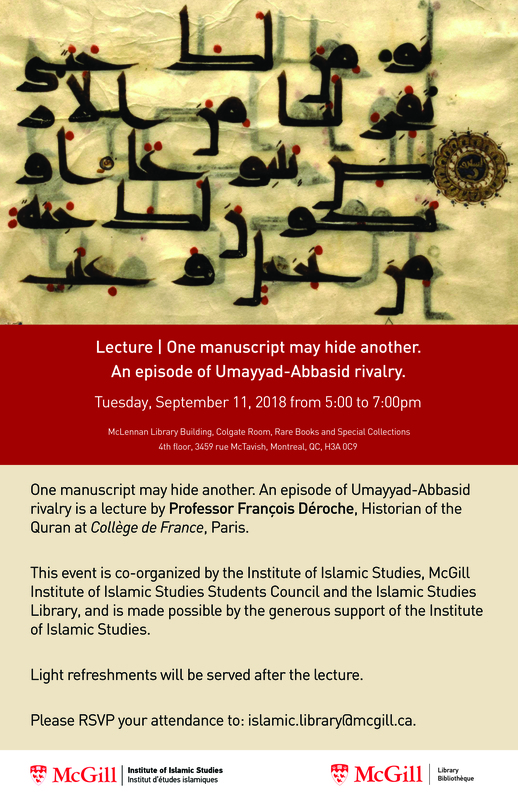 In addition, McGill’s valuable collection of manuscripts and rare books can be explored in order to gain a better and deeper understanding of various aspects of books and manuscripts. 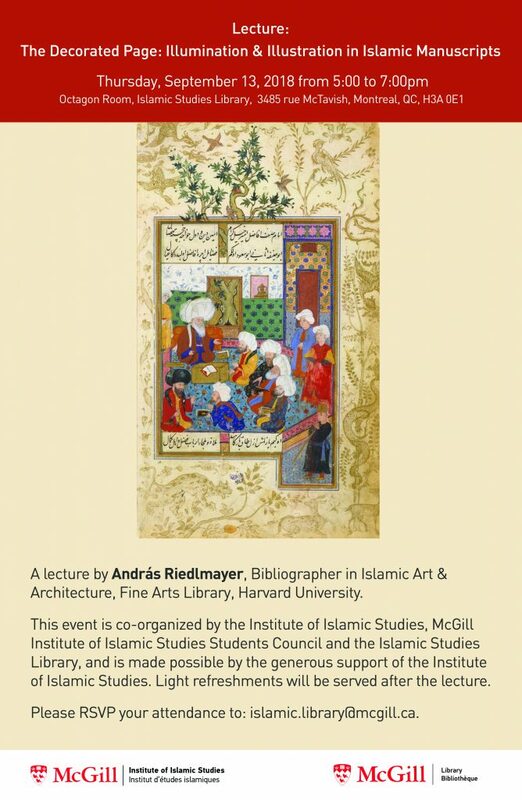 More information on Islamic Manuscripts at McGill can be found here. 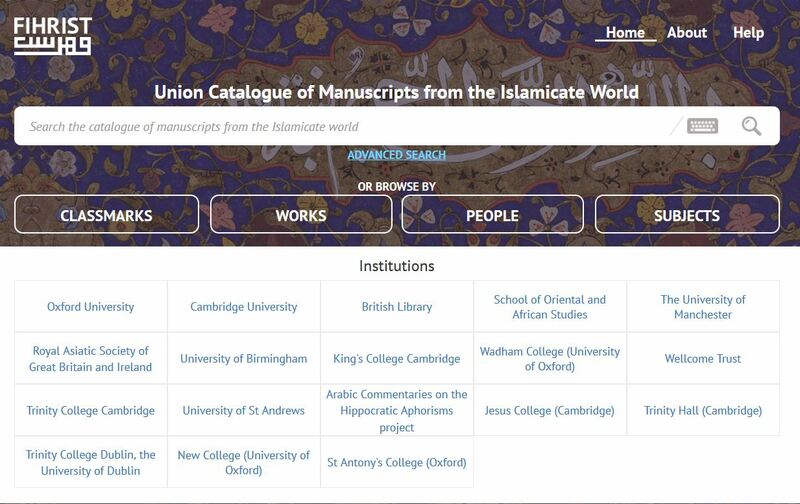 A list of Arabic, Persian, Turkish, Ottoman-Turkish Manuscripts held at Islamic Studies Library Collection can also be accessed here. All collections can be either searched (simple and advanced searches) or browsed. 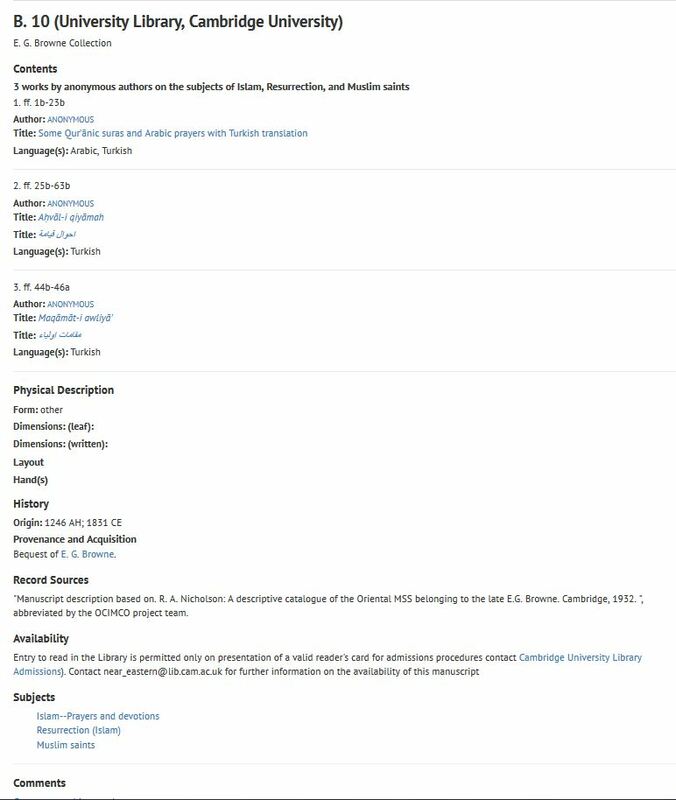 Browsing categories, however, vary from one to another to include year of production/publication, author, title, codex, series, University, subject (Library of Congress subject headings), collection, etc. 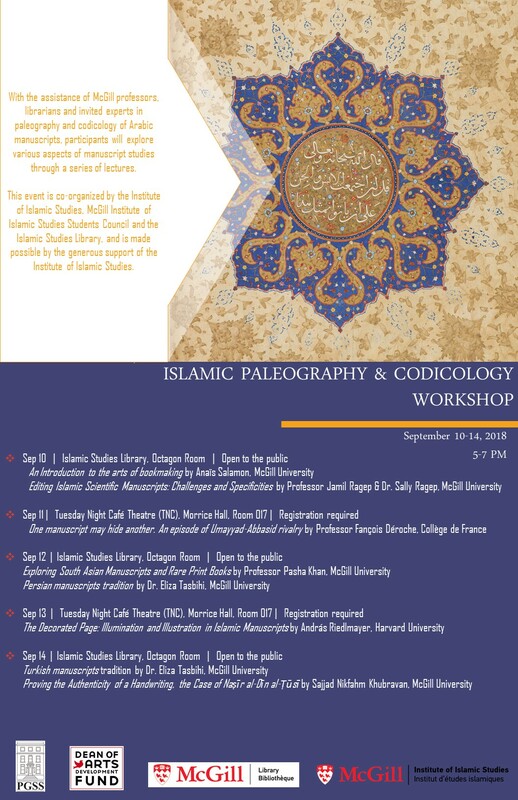 REAL-MS is the most relevant collection to Islamic and Middle East studies as it contains more than 300 Arabic manuscripts, 155 Persian manuscripts, and 50 Turkish manuscripts. In addition, REAL-MS includes an impressive amount of famous Orientalists’ and Hungarian scholars’ personnal papers and correspondence like Ignaz Goldziher’s correspondence (over 13,000 documents). 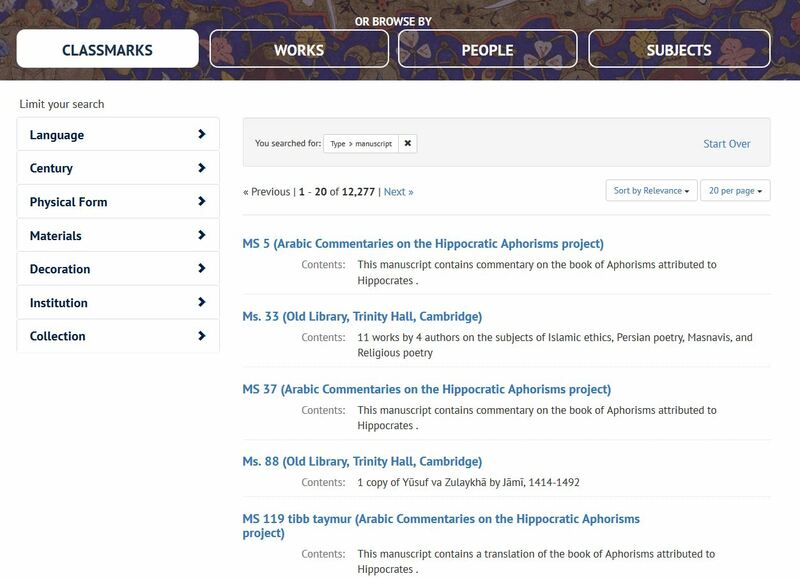 If Persian manuscripts can be previewed and/or downloaded as colour PDFs, access to most Arabic and Turkish manuscripts is for the moment “restricted to Repository staff only”. However, a copy can be requested for research purposes. REAL interface and bibliographic descriptions are available in both Magyar and English. The Memory of Modern Egypt project is an attempt to create the largest digital library of materials of cultural and historical value related to the contemporary history of Egypt, beginning with the reign of Muhammad Ali in 1805 to the end of President Sadat in 1981. The digitized collection is composed of materials drawn from collections of various libraries. 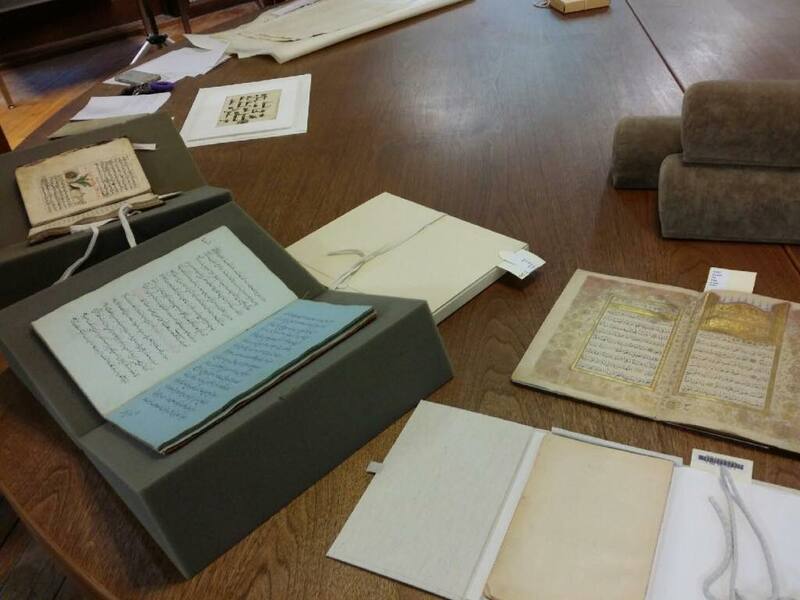 Items include materials from senior politicians and Egyptian writers, as well as materials from many institutions and private collections related to the history of modern Egypt during the past 200 years, in addition to the historical archives of the Bibliotheca Alexandrina. 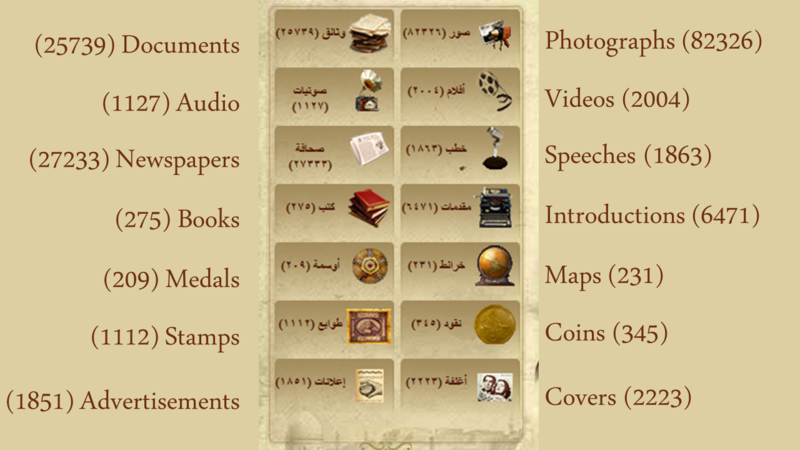 The Digital Library aspires to be the main source of historical material related to the history of Egypt, and has thus been designed in a way that allows the addition of new materials as they become available. 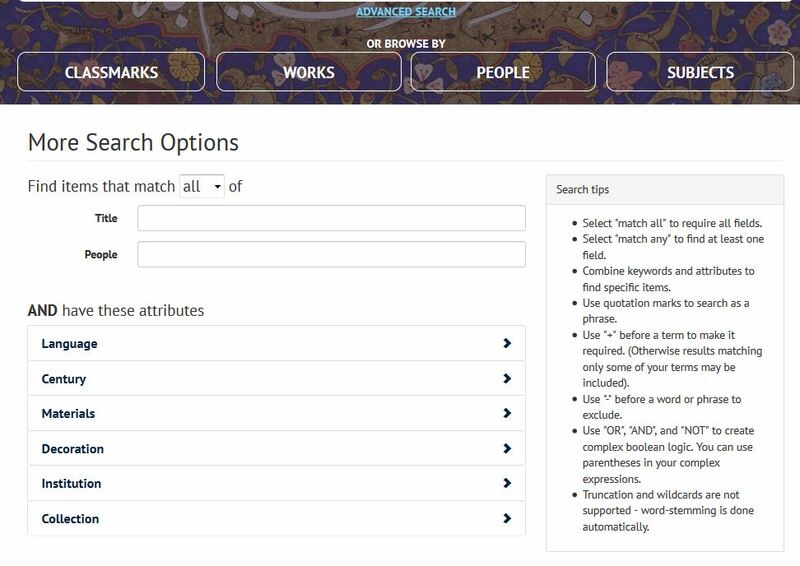 Searching for materials is simply a matter of clicking on the desired topic (rulers, prime ministers, events, topics or public figures). From there, icons appear on the left half of the page indicating the number of available materials for the desired topic, which can be further searched by clicking on the icons. The timeline at the bottom of each page follows the contemporary history of Egypt beginning in 1799 and ending in 1981. This timeline helps the researcher to determine the time-frame for research. For example, when moving from the right side using the mouse until 1860 and from the left until 1900. It reduces the number of materials available to coincide with the selected 40 years. This is shown by changing the number of available materials indicated by the icons on the left side of the page, which match the chosen time-frame. What is the purpose of this website and who created it? 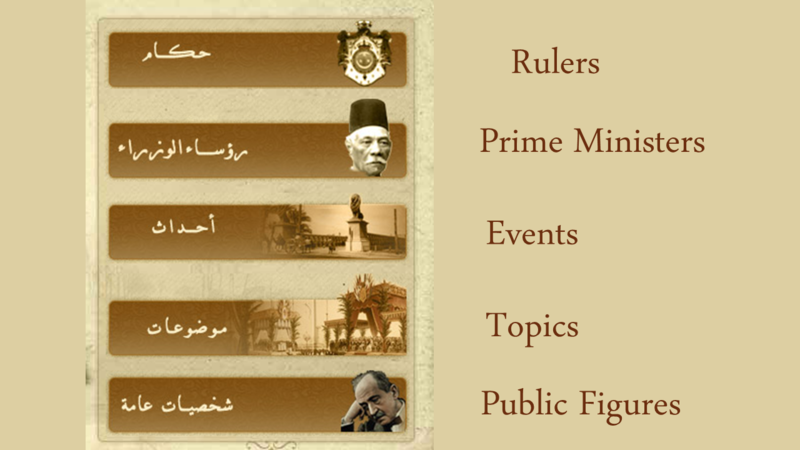 This site documents the history of modern Egypt from the rule of Muhammad Ali Pasha in 1805 until the end of the presidency of the late President Mohamed Anwar Sadat in 1981. There are numerous articles related to the history of Egypt during the past hundred and sixty-seven years. These materials include digital photographs of documents, photographs, coins, stamps, audio and video recordings, among others. 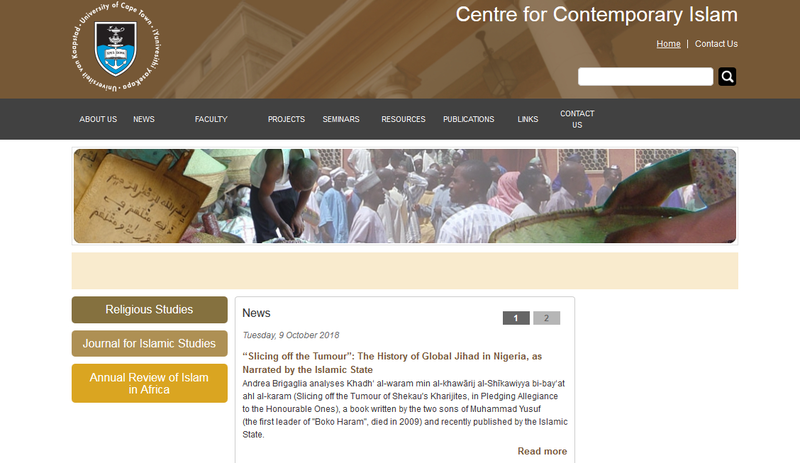 The establishment of this site was a concerted effort between the International Institute for Information Studies (ISIS), a specialized research institute at the Bibliotheca Alexandrina, and the library’s project management, which was responsible for collecting the content of the site and passing it on to the International Institute for Information Studies On the past to be available to future generations in a digital format. Q-Will this site be available in other languages? Thus far, there are no plans to translate the site into other languages and a large proportion of the original material is available in Arabic. Q-Can I upload pictures, movies, documents, etc., from your site? Copyright is held by the contributors to this project, who gave the Library of Alexandria the right to display these materials only for public benefit. The library does not have the right to make these materials available for printing, so one cannot download or print any of the materials available on the site.